Every year, the College of Natural Sciences and Mathematics honors its best educators with the John C. Butler Excellence in Teaching Award. This award, established in the memory of former NSM Dean John Butler, recognizes faculty members who excel in teaching. 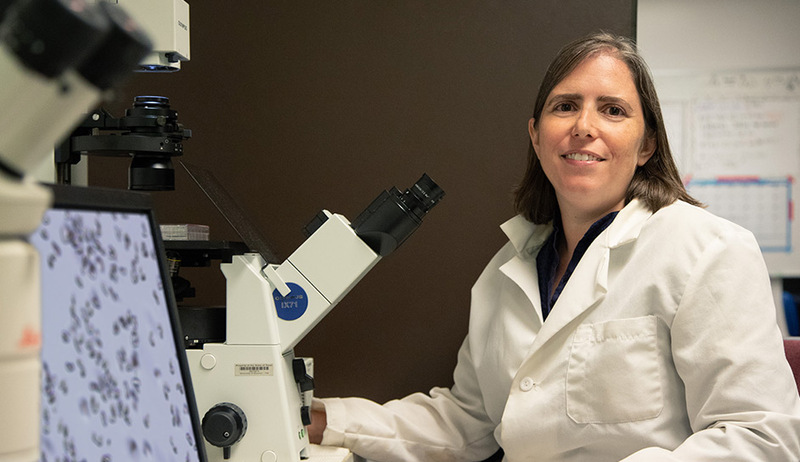 The 2018 Butler Award went to associate professor of biology and biochemistry Rebecca Zufall, who has a long track record as a dedicated teacher and mentor. This award is accompanied by a plaque and a $5,000 cash prize, with Zufall recognized at the UH Commencement for the College of Natural Sciences and Mathematics. In addition to teaching courses in evolution, Zufall also developed a course for non-majors called “The Biology of Food.” In this course, students learn about food in the context of biological concepts such as biodiversity, physiology, cell biology, genetics and evolution. In support of this theme, students have gone on field trips to community gardens and local farm-to-table restaurants. In addition to classroom teaching, Zufall, who runs an evolutionary biology lab, mentored numerous students in research. Almost 40 undergraduate students have conducted research in the Zufall lab, while others have conducted their graduate school research under her guidance.